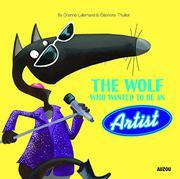 How can the Wolf best express his creativity? The Wolf sits under a tree near a waterfall with a gentle breeze blowing and birds singing. When he expresses his appreciation to Mr. Owl, the bird observes that the Wolf speaks “like a true artist.” Taking these words to heart, the Wolf begins searching for his ideal artistic path. He buys a canvas, easel, brushes, and some tubes of paint and gets to work under the shade of an oak tree. When Wolfette sees his work-in-progress, she gently tells him that painting is not “the right thing for you.” He’ll always be her precious poet. The Wolf takes this tidbit and runs with it. He comes up with one decent rhyme, then hits writer's block. Maybe sculpting? So inept is he that his model, Miss Yeti (pink, hairy, and with a tiny pink bow atop her head), accuses him of playing a joke. This leads him to try stand-up comedy, followed by acting, then singing—at which he really does have talent. The Rocking Wolves are an amazing success, but the Wolf decides that stardom is not for him; he has “way more interesting things to do” at home. The Wolf’s excited curiosity and short attention span should register with young readers, as should Lallemand’s droll ending. Thullier’s bright cartoon pictures enhance the distinct (and distinctly Gallic) personalities of the supporting cast.